A less invasive technique for the diagnosis and treatment of prostate cancer that potentially reduces the risk of infection and other side effects has been developed. It uses magnetic resonance imaging to allow surgeons to target tumours, making these procedures more efficient and accurate - and cheaper than established biopsy techniques. Needle biopsy is the standard procedure for diagnosing prostate cancer and determining the extent of the tumour. Surgeons remove small samples of tissue from the prostate for further examination, but patients often find it uncomfortable. Because tumours are not visible in ultrasound images used to guide the needle placement, biopsy is also performed blind to tumour location and can therefore be unreliable. The new technique uses computer software to present surgeons with an image of tumours so that these can be targeted, taking into account how its location moves as the prostate shape changes due to surgical instruments. In collaboration with clinicians at University College London Hospital (UCLH), a team led by Dr Dean Barratt (UCL Centre for Medical Image Computing) has developed a new way of using magnetic resonance scans of the prostate obtained before surgery for tumour-targeted cancer biopsy and therapy. 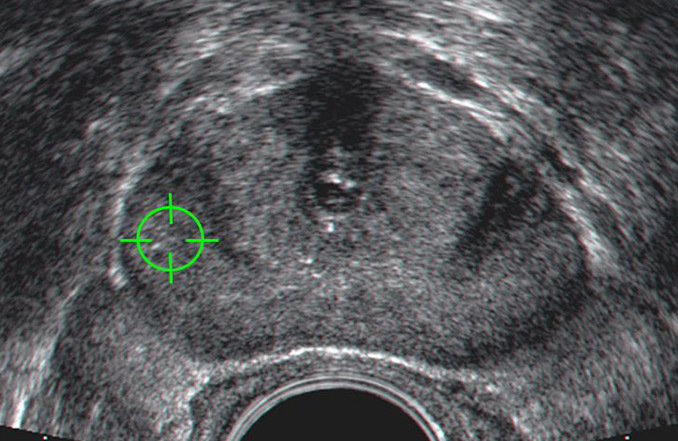 Using this technique, surgeons can target tumours that are invisible in ultrasound images, and only collect tissue samples from regions that appear to be tumours, or treat regions that are confirmed to be tumours. This makes the procedure more efficient, accurate, and cheaper, and can potentially reduce the risk of unwanted side effects. More accurate biopsies in turn provide greater confidence when deciding between different treatment options. To help this, the team developed new clinical criteria for interpreting image-directed biopsy results, which have been part of clinical practice at UCLH since 2009. These criteria were incorporated into an easy-to-understand 'Traffic Light Scheme' for cancer classification. It provides a highly visual way of documenting patient risk by using a colour-coded system that enables the patient to understand the risks associated with their cancer, and, with the help of their doctor, to make an informed choice about which treatment option to pursue. Fifteen centres in the UK and Europe have now adopted the scheme, and there are plans for it to be introduced into all nine hospitals in the London Cancer Network during 2014. It is also anticipated that the scheme will be included as part of the national guidelines issued by the Royal College of Pathologists, which is currently under development. In a clinical trial, the treatment plan was changed for half the men whose tumour was located using the software. In these patients, the size of the treated region was increased to ensure that the tumour was fully removed. Clinical follow-up data are not yet available, but the longer-term impact of employing this technology is that the treatment is more effective than it would have been if performed using standard clinical methods in a substantial proportion of patients. The clinical experience with these patients is being used as evidence of clinical safety and efficacy as part of a submission for CE marking a commercial medical device, called SmartTarget®, that incorporates this technology. A trial to assess the clinical benefits of the SmartTarget® system for targeted prostate biopsy has recently started at UCLH, and three further trials to evaluate its use in three different minimally invasive therapies are in the final stages of approval and will begin early in 2015. The potential for the technique is large, as prostate cancer is the most common male cancer in the UK, many countries in Europe, North America, and Australasia, and is a leading cause of cancer-related death in the western world. Having benefited from substantial translational funding from the National Institute of Health Research, the UK Department of Health, and the Wellcome Trust, the technology developed in this research has been developed into a commercial product to be licensed for use in the UK market early in 2015. Supported by UCL Business PLC, this product and associated patents will form the basis of a spinout company focused on delivering the technology to hospitals in the UK, Europe and North America.